Coming soon from Camp is a new fall arrester called the Goblin. Designed for use on ropes of 10 to 11mm with a short non-shock absorbing lanyard, it has also been tested to cope with a 200Kg rescue load. 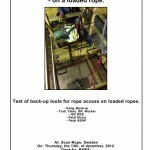 Although the Camp Goblin operates using a cam to squeeze the rope to arrest a fall, Camp seem to have come up with a device which can also be used on tensioned lines (allowing a rescuer to undertake a rescue from the top down or ground up using the casualties lines – some other back-up devices release if the rope below the device is weighted). Abaris International are due to receive the first Camp Goblin when it becomes available and will update our site with feedback following testing. The exact price is to be confirmed. Further information can be found here: Camp Goblin (inclues video of the device being tested with a rescue load, as well as being tested on a tensioned line).